Hertel Plus Odour Eliminator All Purpose is specially formulated to fight food, smoke and pet odours at the source. Garbage cans / Pet litter boxes and crates / Appliance interiors (microwaves, washers, refrigerators) / Stove tops, range hoods / Dehumidifiers, vacuum cleaners / Lunch boxes. The aroma of garlic, onion, curry and fish are delicious in your carefully crafted meals. But in your kitchen? Not really. 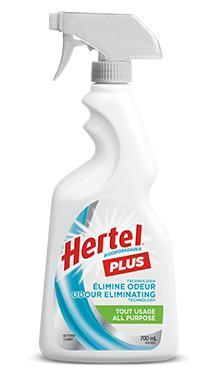 Hertel Plus Odour Eliminator All Purpose works on both the mess and the foul smell, leaving your kitchen cleaner and fresher than ever! Use Hertel Plus Odour Eliminator All Purpose to clean and freshen your kitchen pantry and cabinets. Keep a bottle of Hertel Plus Odour Eliminator All Purpose handy to clean and freshen various household surfaces every day. In addition to removing dirt, it leaves a fresh, clean scent that you’re sure to enjoy!